Busting Driving Myths: Drinking vs Texting - What’s More Dangerous? The Myth: You’ve heard the statistics. Every two minutes, someone in the United States is injured in a car crash caused by drunk driving. In a recent year, over 28 million people admitted to driving under the influence of alcohol; that’s more people than live in the state of Texas. 31 percent of traffic accident fatalities are a direct result of drunk driving. It’s only natural to think that driving under the influence of alcohol is the most dangerous thing you can do behind the wheel. But is that the truth? The Verdict: Wrong! There are things you can do behind the wheel that are more dangerous than driving drunk. Like… texting. A recent study tested driver reaction time behind the wheel under several different types of distracted driving. Distracted driving is referred to as any activity that can potentially divert a person’s attention away from the road as well as the mental and physical tasks of driving. The results are pretty alarming! The study found that people who read, or sent, text messages while driving experienced a 35 percent slower reaction time behind the wheel than those who did not. In comparison, driving under the influence of alcohol had a 12 percent decreased reaction time. For those who were “stoned” and under the influence of cannabis, reaction time slowed by 21 percent. Nine Americans are killed every day as a result of texting and driving. There is a one in four chance that a car accident involves the use of a cell phone in some way. It takes five seconds for a driver to glance away and see a text message; studies prove that one can only remove their eyes from the road for two seconds before experiencing increased danger. The facts are simple and clear. Texting while driving is dangerous and puts lives at risk! 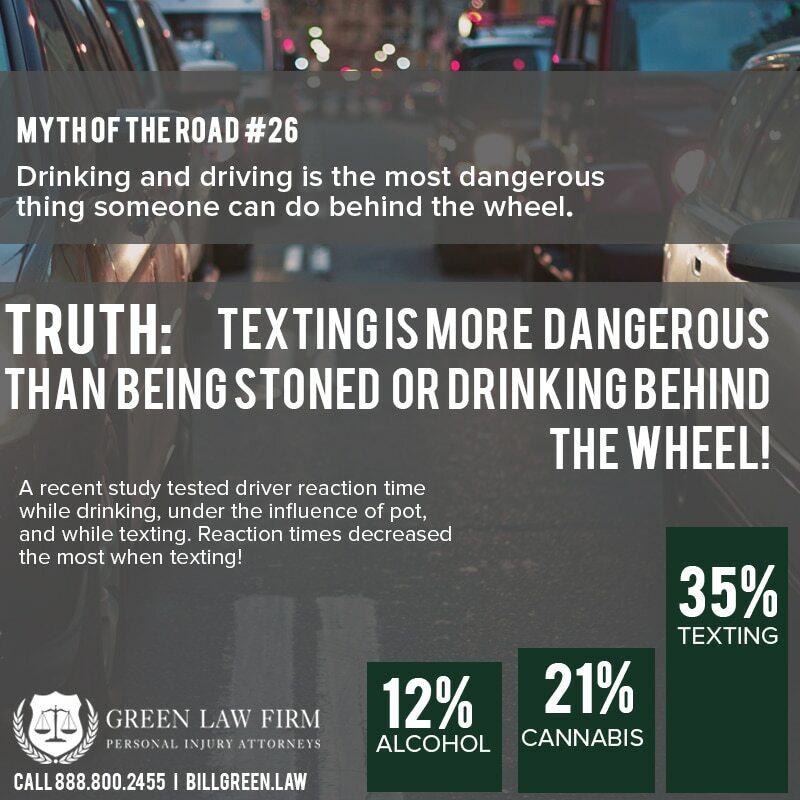 If You Or A Loved One Has Experienced An Accident Because Of A Driver Texting, Green Law Firm Can Help! South Carolina follows the statute of comparative negligence. This means that more than one party can be held liable for a car accident; someone can be up to 51 percent responsible for an accident occurring and still be eligible to receive compensation for damages accrued. The less a party is responsible for an accident, the greater the percentage of compensation they may be awarded for medical bills, lost wages and pain and suffering. The experienced professionals at Green Law Firm will review your case with the care and attention it deserves at no cost to you. We are compensated based only on monies that you are awarded! If you have been in an accident caused by a distracted driver, let us help you get the justice you rightly deserve!